SBI PO Result 2017 can be checked from here. State bank of India had successfully conducted the Pre examination on 29 & 30 Apr and 6 & 7 May 2017. The result of Prelims is to be declared by State Bank of India at sbi.co.in. Those who qualify pre, had appeared for Mains held on 04 June 2017. So candidates who have chances of clearing Main, should start their preparation for GD/Interview now. The result of SBI PO 2017 will be notified here and you will be able to check it here via a direct link. 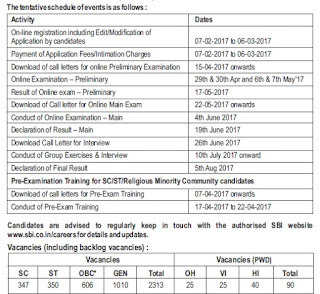 There are a total of 2313 posts of Probationary Officer which are to be filled through this recruitment drive. Candidates have to give the online exam at various centres. Now the Pre exam results are under preparation. This process will be finalized shortly as results will be declared by 17 May 2017. You can check SBI PO exam Result 2017 from below link as soon as they got declared. Also you will find latest updates of this SBI Result from here. State Bank of India had announced the result of Probationary Officer Main exam result on 04 July 2017. 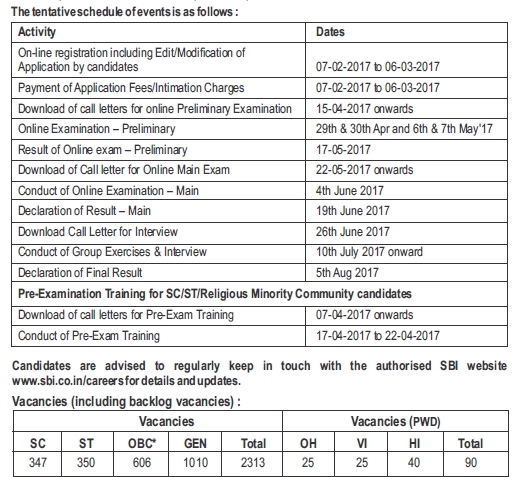 Main exam was held on 04 June 2017.Candidates are advised to visit Bank's website www.sbi.co.in/careers or www.statebankofindia.com/careers or more updates. 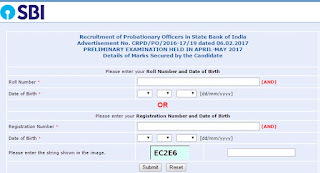 State Bank of India had announced Probationary Officer marks on 16 May 2017. SBI PO Result is available through SBI PO marks obtained . You can visit the marks obtained page to find your result / qualifying status. Online registration dates: 07-02-2017 to 06-03-2017. SBI PO Result of Pre Exam declared on – 16-05-2017. SBI PO Final Result will be declared by 05 August 2017. Now the process of preparing results will be done. The marks obtained in the Preliminary Examination (Phase-I) will not be added for the selection. The final merit list will be based on the marks obtained in Main Examination (Phase-II), both in Objective Test and Descriptive Test, will be added to the marks obtained in GD & Interview (Phase-III). Pre Exam Score card: The marks obtained in Prelims exam is declared on 16 May 2017. You are updated about SBI PO Result via this page. As soon as any new update comes, it will be shown here. This page will let you updated with SBI PO Result for Pre & mains, marks score card, GD / Interview result and Final Result / merit list, Joining etc..
SBI PO Mains Exam date: 19 June 2017. You can check the category-wise actual cut off marks of SBI PO Pre 2017 (out of 100). Official cut off marks will be posted here as they got released. The cut off marks will be declared along with SBI PO Result 2017 and will be notified here. State Bank of India will declare the final merit list i.e. list of shortlisted candidates on 05 August 2017. The roll numbers of selected candidates will be shown in that pdf. After the pre exam results, got prepared, State Bank of India will upload the roll number of candidates in a pdf file who can appear for Mains. SBI PO Result 2016 for Prelims is announced on 16 May 2017 and you can check them from below link.